In preparation for the premiere of The Walking Dead's eighth season, AMC has released a new synopsis for the upcoming batch of episodes. Unlike the ramp up to Season 7, fans aren't wondering which member of Rick's group will be slaughtered by Negan to start the season. In fact, Season 8 promises almost the opposite. The Alexandria community is ready to flip the script and bring the fight to the Saviors in Season 8 and the new description of the 16-episode run teases just that. 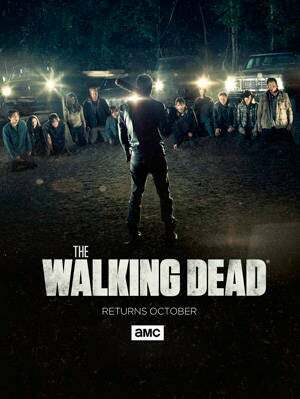 "Last season, Rick Grimes and his group of survivors were confronted with their deadliest challenge yet. With the comfort of Alexandria, they let their guard down, only to be reminded how brutal the world they live in can be. "Feeling powerless under Negan's rules and demands, Rick advocated the group play along. But seeing that Negan couldn't be reasoned with, Rick began rallying together other communities affected by the Saviors. And with the support of the Hilltop and Kingdom, they finally have enough fire power to contest the Saviors. "This season, Rick brings 'All Out War' to Negan and his forces. The Saviors are larger, better-equipped, and ruthless -- but Rick and the unified communities are fighting for the promise of a brighter future. The battle lines are drawn as they launch into a kinetic, action-packed offensive. "Up until now, survival has been the focus of Rick and our group, but it's not enough. They have to fight to take back their freedom so that they can live. So that they can rebuild. As with any battle, there will be losses. Casualties. But with Rick leading the Alexandrian forces, Maggie leading the Hilltop, and King Ezekiel leading the Kingdom -- Negan and the Saviors' grip on this world may finally be coming to an end." The synopsis kicking off with "unlike Season 7" is already a good start in the eyes of many fans of The Walking Dead who were frustrated with the most recent 16-episodes. Following a bullied Rick Grimes and watching members of the Alexandria, Hilltop, and Kingdom communities die one by one with no consequences for their death wore thin for many. Now, rather than Daryl being locked in a cell and tortured, he will rally with his fellow survivors fans have come to love through 99 episodes. From the moment Season 8 begins, it will be clear to viewers the focus of The Walking Dead is back on Rick Grimes. For fans hungry for more Walking Dead, they'll get a small fix in the form of a Season Eight preview special airing on AMC ahead of Fear the Walking Dead's upcoming midseason premiere.